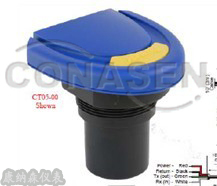 FLOWLINE EchoSonic II Ultrasonic Level Transmitter CT03/CT05/CT08/CT10 - Beijing Conasen Tech. Co., Ltd.
introduction：The general purpose ultrasonic level transmitter provides continuous level measurement up to 32.8’(10m) with a 4-20 mA signal output, and is configured via our free Webcal software. This non-contact liquid level sensor is ideally suited for corrosive, ultrapure, sticky or dirty liquids, and is broadly selected for bulk storage, day tank, lift station and process tank level applications.